To give you some insight to our character design process for Beautiful Scars, I pulled a panel that would work out beautifully as an example (it also happens to be the panel I’m working on). In this panel, the Princess sees her friend the Woodsman. She’s about to give him a big ol’ hug. To me, the moment is about the action. And after channeling my inner Princess and posing the pose myself, I chose the moment where she would gather herself before the hug. In other words, she’s not walking out like a robot, arms in the air in a hug-like motion. First step is to go through an old Warner Brothers exercise and create lines of action. ASIFA has a great handout I use in my classes pulled from the great Preston Blair book on animation. In essence, I use the fattest digital brush I have and lay down a core mark thinking about movement running through the character. I’ll cheat and add smaller marks to suggest shape. 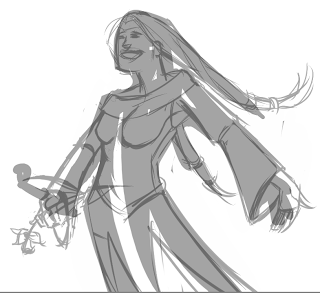 The second step is to use this gesture drawing as a base to sketch onto using layers. Making the lines of action a bit more transparent, I draw directly on the base sketch. I’m thinking about construction, silhouette and anatomy, but I’m constantly reminded about movement. 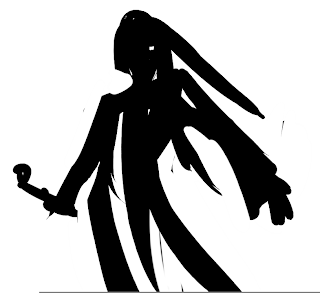 To make a stronger character silhouette, I adjusted the rose to point down, but the energy still feels right. David Guertin always preaches clear silhouettes (and now I do too! ), and all of the important details are an easy read at this stage even if I deleted all of the internal information. The last step is to ink. Sometimes, the penciling stage will get tighter if I’m nervous about details. But I feel if you over pencil, then you lose all your energy on the inks stage. Taking a cue from Bruce Timm, I try to push my line as far as I can. 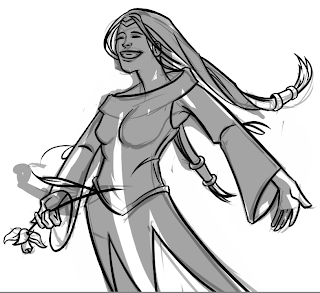 Inking almost becomes a game… Can I define an entire arm in one stroke? Inks = Energy! The process for this book is pretty loose, but I think the effects are worth it. Since I’m known for working in a tight style, it’s nice to relax and enjoy the act of drawing again. Guin is constantly pushing me to be looser and looser and I hope it shows in Beautiful Scars.